Developing Leaders Who Deliver Results! Managers are given a title but not the tools needed to succeed. Some people may look good on paper but cannot perform. Pipeline is full, but not enough is being closed. Employees need to be coached AND mentored. Sales cycle is too long, or getting longer. The business has successes, but there's no culture of accountability. There is never time to work on the business because they are working in the business. An interactive leadership workshop designed to introduce ways to more effectively manage your team for maximum results! Covering topics ranging from improving communication to managing different behavioral styles to effective recruiting and hiring, the sessions set the foundation for you to elevate your management and leadership skills to the next level. This includes lunch, materials, and our D.I.S.C. Assessment, to be used during the session. The 13 Blind-Spots that can take any business off track. 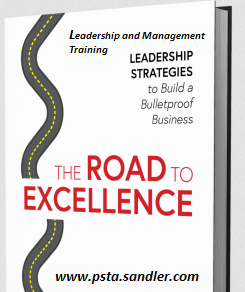 6 Leadership Strategies for Organizational Excellence. How to recognize "hard work" vs. "productive work" as you identify the bottlenecks that are keeping you from higher levels of success. How to carefully implement changes in your leadership style that result in long-lasting, positive effects on your business.